Why this fungus may surprise you at first, an alien civilization has not "marked" your lawn with circles for navigational usage. 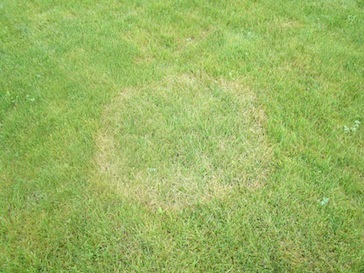 Nerotic Ring Spot is perhaps the strangest of the lawn fungi that can appear in your lawn. We'll take a look at why you get this common fungi, how to get rid of it, and how you can prevent it in the future. What is Necrotic Ring Spot and What Causes it in my Lawn? Ring Spot is a fungus that thrives during times of higher temperatures and drought conditions. Appearing as thinned, circular "ring" approximately 12-36" in diameter, ring spot eventually kills the grass within the circle. These patches can spread to other areas of your lawn, and cause major damage. 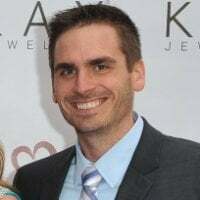 How Do I Get Rid of Ring Spot? Much like other fungi, Ring Spot can be eradicated with a fungicide treatment. Ring spot is very aggressive and will not "grow out" like other fungi. In less severe cases, ring spot can also be treated with moderate to high amounts of phosphorous and potash. How Can I Prevent it in the Future? Raising Your Mowing Height - Proper mowing can prevent most lawn care fungi. Mowing your lawn too short often puts stress on the turf plant itself, reducing it's ability to fight disease. Keep mowing heights at a minimum of 3" to keep your lawn healthy. Reducing Soil Compaction with an Aeration - Compacted soil can lead to thin areas of stressed turf. A lawn core aeration has many benefits that can lead to a healthier lawn. A Well-Balanced Lawn Care Program - Your body is at it's best when giving the proper amount of nutrients and food. This is no different for your lawn! A lawn care program that delivers nutrients to your lawn throughout the season can give you a healthy happy lawn! Proper Watering Practices - Did you know there is an improper way to water your lawn? Believe it or not, just watering your lawn in the morning can help cut down on disease. Summer is the time of year when you should be enjoying your lawn, not worrying about what may be wrong with it. That's why Weed Pro has put together a Free Guide, "The 5 Most Common Summer Lawn Care Problems" to help you get your lawn looking better quicker, that way you can enjoy it more! In this guide we'll talk about the 5 most common lawn care problems and tell you how to get rid of it! The best part of this guide is that it's yours ABSOLUTELY FREE! All you need to do is click the button below!